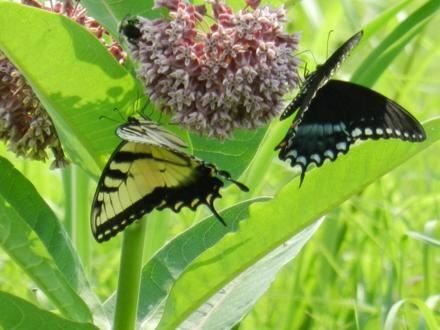 All parts of the milkweed contain a mild poison. Just as the monarch caterpillar can eat some and survive, so can we. Just don't overdo it, or you may experience gastrointestinal distress. Prepare the fruit by removing pits or seeds and cutting into bite sized pieces. Strawberries, blueberries, cherries, and peaches are in my markets when the milkweed is blooming. Put the cottage cheese into a serving bowl. Add prepared fruit and milkweed blossoms and stir gently to mix. Sprinkle nuts on top and serve. On the sunniest day of the summer, look in fields and along roadsides for the yellow flowers of Hypericum perforatum (aka St. John's/St. Joan's wort) and get ready to make two of the Great Remedies. Take both 100 proof vodka and pure olive oil with you when you go out to stalk St. John's/St. Joan's wort, bottles of various sizes, and a pair of sharp scissors. Depending on the abundance or scarcity of flowers, I harvest anything from just the blossoms to the top third of the Hypericum plant. So long as the day is sunny and the plants dry the tincture will be active and medicinal even if it contains a fair amount of stalk and leaves. I also make a quart of this tincture as I use it frequently, in dropperful doses. If you are using tops rather than just flowers, chop as needed. 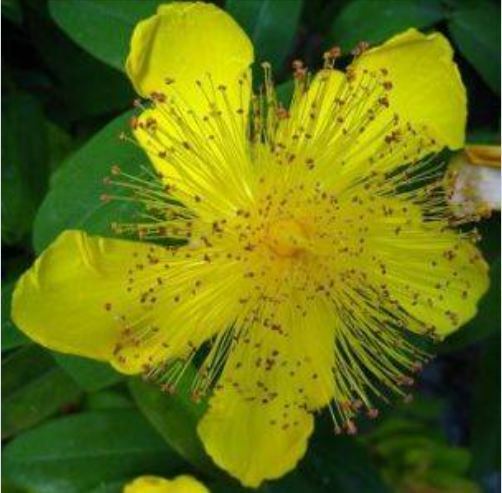 I often harvest Hypericum flowers right into my jar and fill it with vodka or oil while still afield, insuring optimum freshness and maximum fairy blessings. Cover tightly. Label. I do not put my oil in the sun, but some people swear by it. Try one each way and see what you think. Your St. J's tincture and your St. J's oil will be ready to use in six weeks. 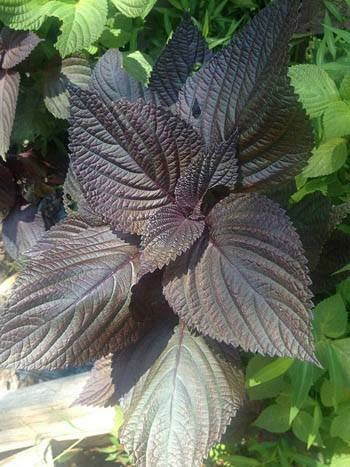 Red-leaved shiso, also known by the awkward name "beefsteak plant," is wonderfully easy to grow and a delight to the eyes and the palate. 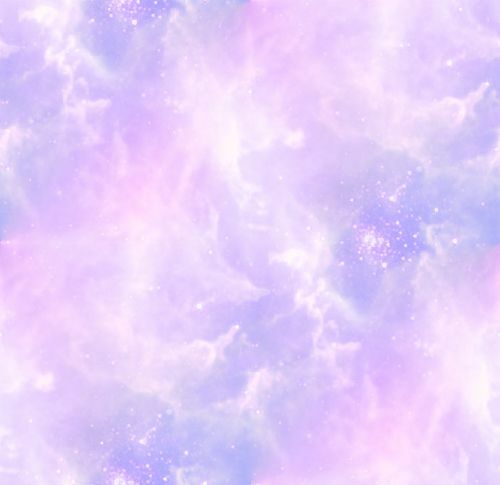 Like holy basil (tulsi) – its sister – shiso is an adaptogen with high levels of antioxidants. I love shiso in salads, gazpacho, marinated cucumber dishes, and anywhere else a dash of color and an interesting taste is welcome. Right now I am making shiso vinegar, shiso honey, and shiso pesto so I can enjoy it all winter too. This pungent, aromatic, warming herb is known for its antibacterial, antiseptic, antispasmodic, antitussive, tonic, carminative, diaphoretic, emollient, expectorant, and pectoral actions. No wonder its considered so useful when dealing with asthma, colds and chills, nausea (a tea of the stalks is traditional in China as a remedy for morning sickness), abdominal pain, food poisoning, allergic reactions (especially from seafood), bronchitis and even constipation. The juice helps heal cuts and wounds. The high-protein tasty seeds are antiasthmatic, antitussive, emollient and expectorant. But don't eat too many, as shiso self-sows readily if sufficient seeds are left on the stalks. As with all mints, there are lots of varieties of shiso available. I prefer the red-leaved shiso because I am into consuming high levels of the antioxidant anthocyanin, found in purple and blue plant parts.